I address this post primarily to the English-speaking audience due to two reasons: first, I will be talking about the Western type of perception of “middle-class” life, driven these days mostly by what you tend to call “responsible consumption” and, second, due to the fact that I will be referring to the US-based incomes and spending statistics. My working environment gives me a luxury opportunity of daily communication with people from almost all parts of the world, including Europe, Asia, Northern and Southern America, Australia and Africa. From them I’ve learnt that educated youth, representing modern society employees, share the same attitude towards their life standards. That would typically include seeking estheticism (anywhere from landscapes to architecture) and humanism, rejecting blatant luxury and glamour, caring instead about waste management and wildlife, healthy foods and exercises, science and technology advances, which all perfectly fit the 21st century as I pictured it for myself back in my childhood. But having paid these compliments to you, my dear Western friends, I would now like to focus your attention on something you don’t take into account. Today I will speak about the dark side of the modest, reasonable or responsible consumption. I have heard that a lot from you: “I don’t really care about money, I only need fair enough to be free of thinking about sustaining life and to leave my mind for creation and work”. I like these criteria, but something is missing from this equation, namely whether you really can afford this modest life. Let’s take a chocolate bar. Don’t bother it being a best example of junk food, we need it only for calculations. If you are employed by a successful modern company, I bet you can afford one now and then. 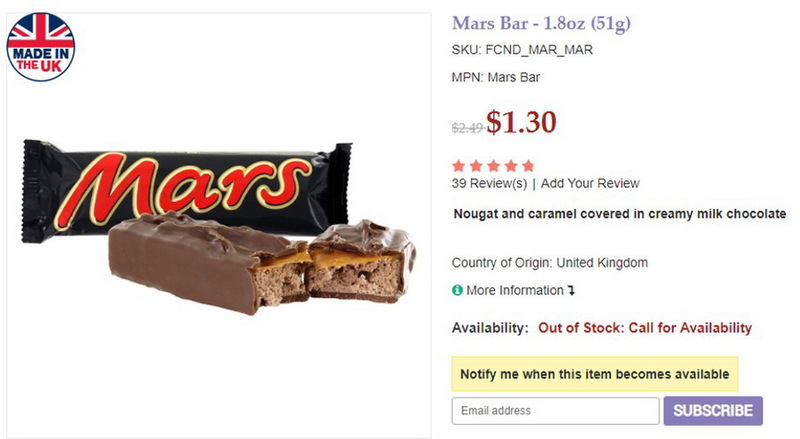 A chocolate bar will cost somewhat between 1 and 3 US dollars, right? Something you definitely can buy without any second thought. I like it when we have training sessions or team meetings – there always would be some bowls with candies and chocolates and meeting leaders would say – go, have some to boost your brains for brainstorming and moving your company forward in this world of business competition. And everybody would go: mmm, yummy! It had occurred to me previously when I saw TV/Internet news on various political official meetings – they are always served with bottles with drinking water (sparkling /non-sparkling) and paper notepads. And I thought, interesting does the value of their decisions outweigh the pure water, plastic garbage and trees consumed for their meeting. But this is a different topic, sorry. Back to the chocolate bar. I took Mars as an example simply because I could found some useful information about. It could be any other manufacturer, does not matter. “We are more like a family”. Why they always say that? Ok, I will save this discussion for the future. So, I asked myself, what the price of one bar consists of? Loosely, cost of materials (nuts, cocoa-beans, caramel, sugar, all these multiple “Es», etc. 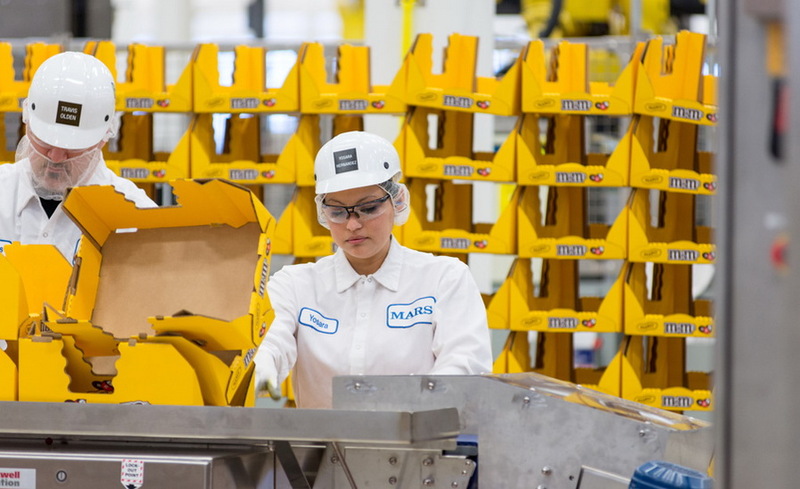 ), factory maintenance, logistics, taxes and salary. Right? Anything else? All that together turns into 1-3$ per unit in the supermarket. Let’s take packing. I assumed $18 per hour, 8 hours per day, 20 days per month. This is just for rough estimates. I don’t know how it really works at the US factories, so feel free to correct me in the comments section. We got $28,514 net, or how they call it “take-home pay” annually. Then I asked myself: what a US person can afford for this salary and searching for an answer found this interesting budget calculator. I picture Jane as a young individual with high-school diploma, no relatives in Topeka, thus need to rent an apartment (or buy one), a private car, living along, no kids, and $5,000 in savings. 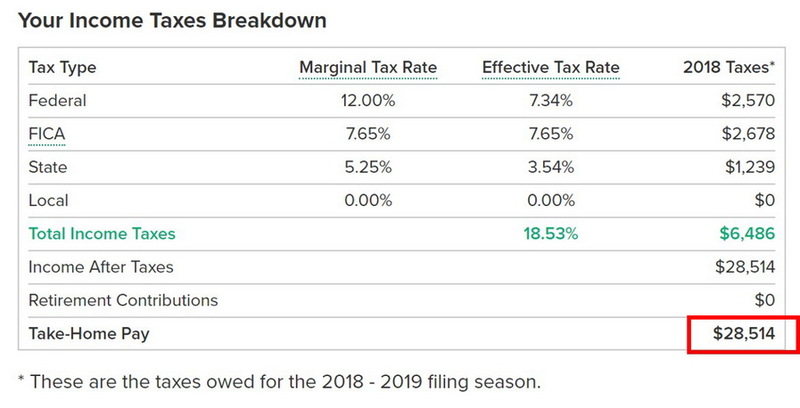 $28,514 NET as the only income (thus for the simplicity the tax field is 0). And then this budget calculator suggests to fill in various expenses fields to check what you can and what you cannot afford. So, my goal was to fill everything (in a reasonably balanced way) to get “okay” from the calculator. Average individual medical expenses – $8,210 annually (according to CNBC). Since we are dealing with a young person I took $500 per month (or $6,000 per year) for insurance and another $50 per month for out-of-the-pocket payments. 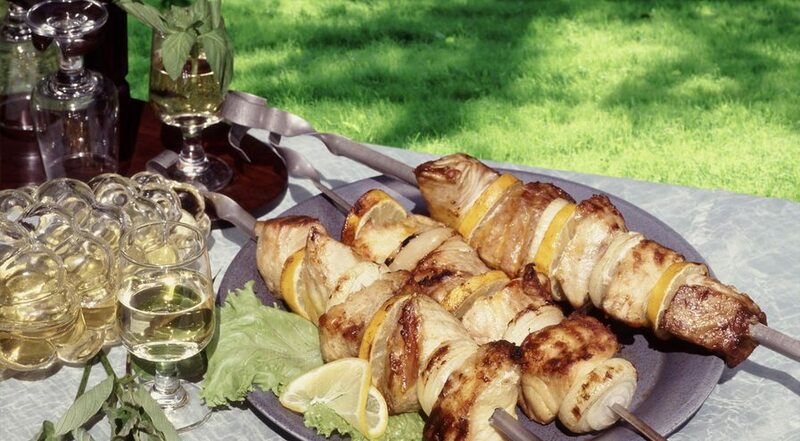 Average food consumption – Jane, according to the statistics of the US Department of Agriculture consumes approximately 18% of the pure income worth of food. That gives us $5,132 per year or $428 per month. I took $400 per month for my calculations. For pension savings I simply referred to the recommendations of the calculator – at least 15% of the income. My imaginative employee will be saving $4,284 per year, which is slightly above the 15% threshold. 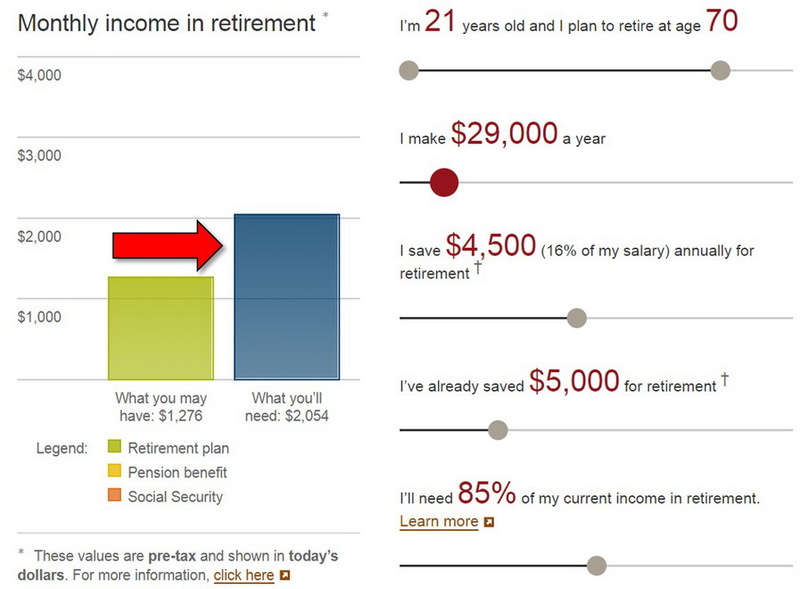 Still, according to the retirement income calculator Jane will face a significant deficiency (red arrow) when she reaches her retirement age. Even if she starts working at 21, retires at 70 and has a deposit of $5,000. So, we needed to add more into the retirement savings, but I am afraid we could not really afford it. 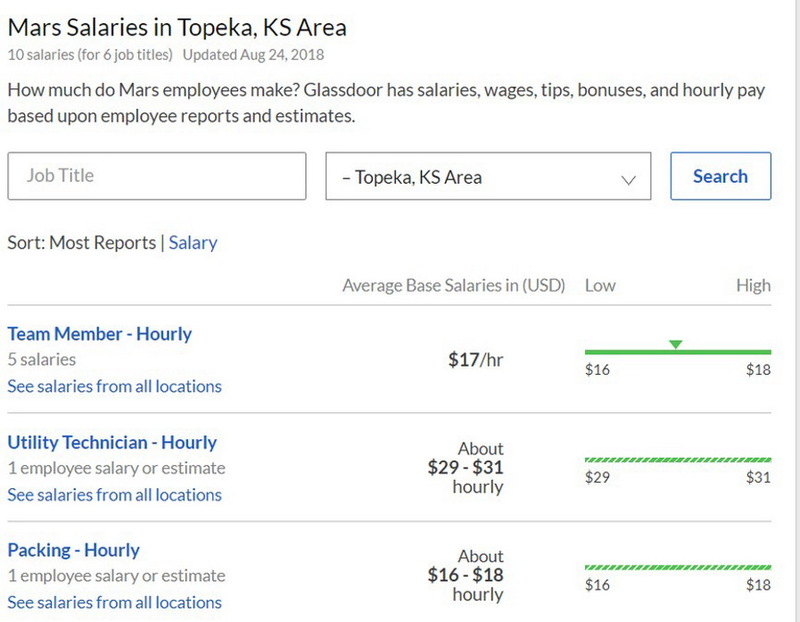 Average spending for rent – I googled that in Topeka you can have an apartment for $400 monthly, plus you should plan $200 for the related insurance. Sorry, already closed the sources, so please correct me if I am wrong. Take your time to review it carefully. This is a life of an individual in a modern society in the 21st century. 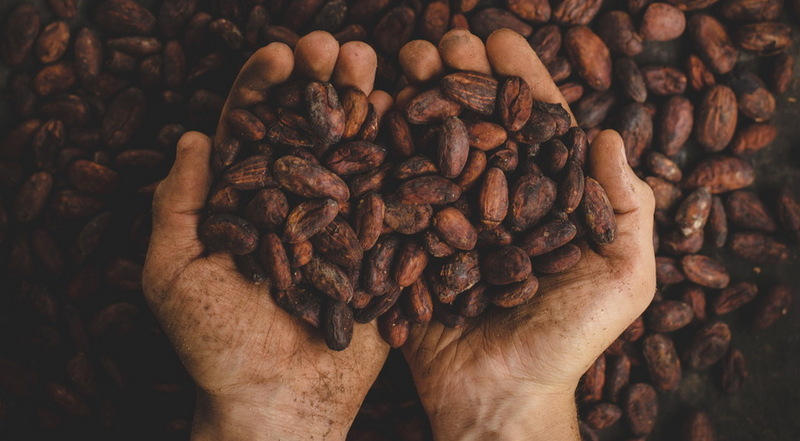 The labor of this person, their energy, life time, health stamina, perspectives, dreams, everything is put into the affordable cost of a chocolate bar, which we will use to boost the energy of our brains. Now, imagine for a second that Jane is you, or even better, your child. Then open this calculator (the link is above), fill all fields in accordance to your own life experience, in accordance to a pattern, which you would like your children to have and check what NET income it requires. 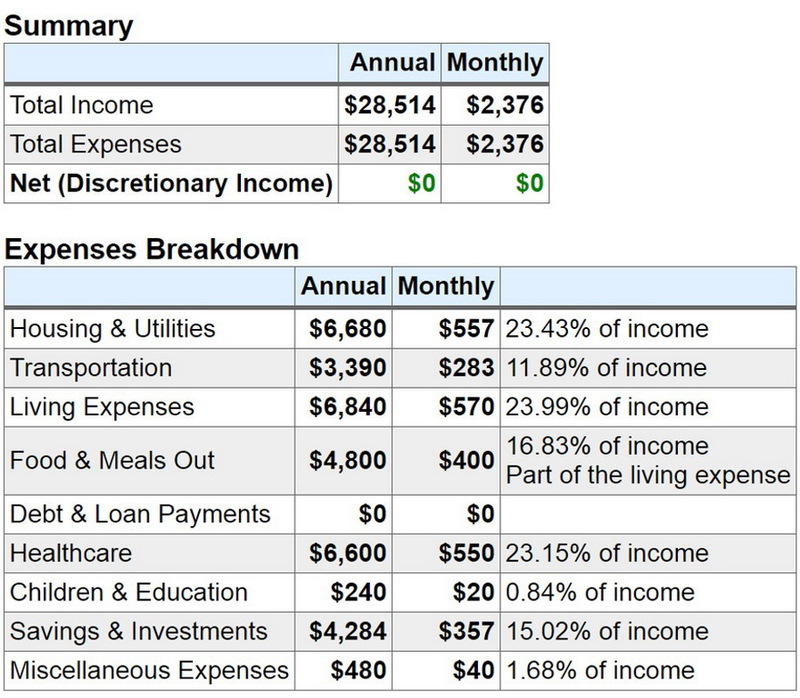 Compare it to the Jane’s income and ask yourself the second question. What if Jane demanded and had a salary big enough to afford your life opportunities and your living conditions – how much the chocolate bar would cost then? How affordable it will be now for you as a middle-class representative. 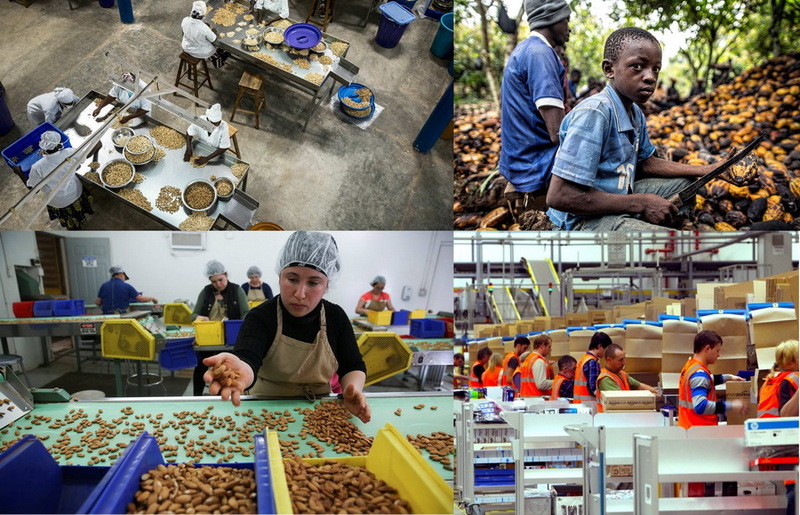 What if all employees, involved in the chain of chocolate bar production, from cocoa beans and nuts farming to manufacturing and logistics, from sales to waste management, had fair living conditions, including centralized waterline and drainage, house heating, and fair life opportunities, including education and healthcare? How much would the chocolate bar cost then? Would you still address yourself as a middle class? What if I tell you that the absolute condition at which you can fairly live and plan, fairly consume and develop, is that many other people, who you do not see, have to accept very unfair life? And when you understand that – ask yourself one more question. Don’t you think that poverty is an opposite side of wealth? And one cannot be without another. Some people call it dialectics. If you feel interested – I will share more thoughts on it. почему на всех фото у белых мужиков закрыт рот? что за расистский сексизм?